I feel like something rich and soulful, that I can be able to eat with my hands if I want to. And what is better than pap and meat. But I’m Ju-Jing up the traditional African with traditional French tonight. 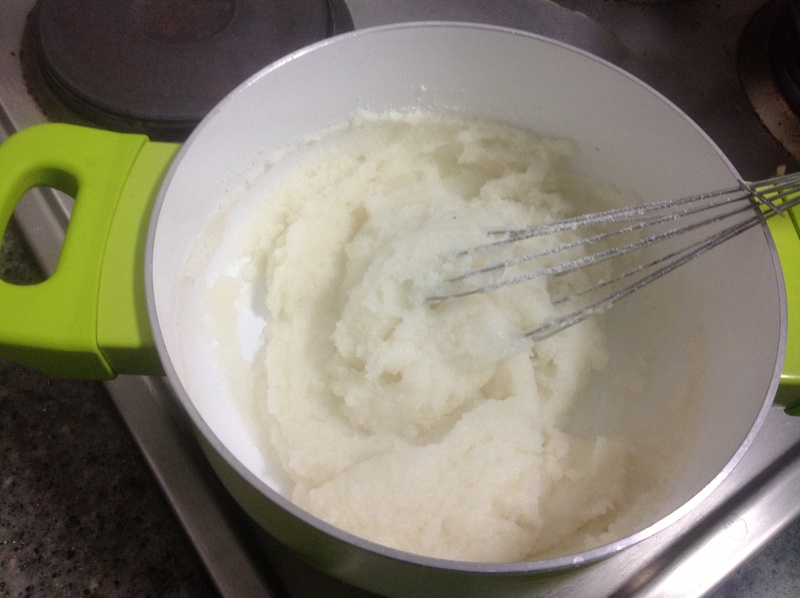 I’ve mentioned pap on this blog before, what it is; is a simple stiff porridge made from maize, cooked like Polenta. You can make it thinner and it becomes a porridge you eat in the mornings, or stiff or thicker and enjoy it with your braai( barberque) or make it course and it becomes Uphuthu. 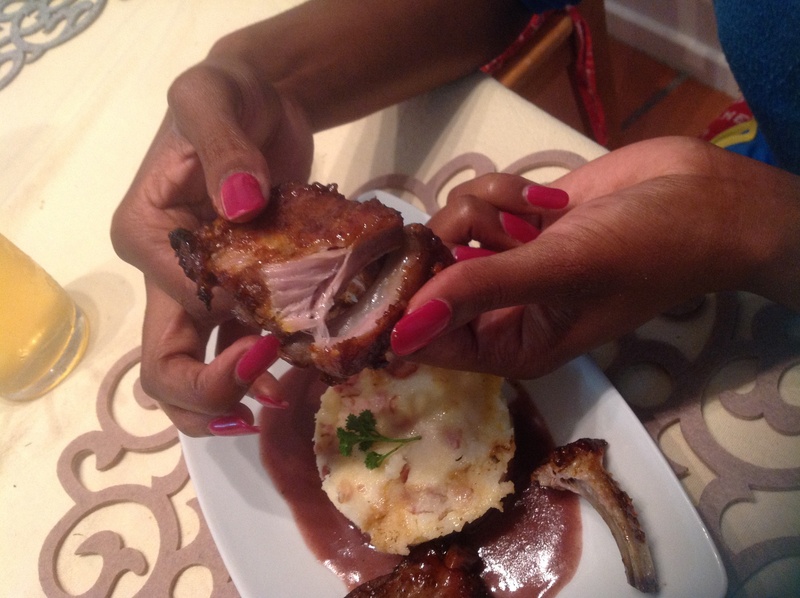 You can check out Uphuthu and Asian gammon in the archives, to see how to make it. This starch is a staple in South Africa and a lot of African countries. My preparation of the pap is inspired by the ‘Road trip with G. Garvin’ from the foodnetwork channel. I’ve been reading up a bit about French cuisine and especially on their many sauces. Did you know the term ‘cuisine’ does not mean food, it actually translate ‘kitchen’ in French? Anyway, apparently( according to Wikipedia) there is a collective of sauces called the ‘5 mother sauces’, as knighted by Auguste Escoffier in the 19th century. These sauces form the basis of almost all French sauces. And they are; sauce Velouté, sauce Bechamel, sauce Espagnole, sauce Hollandaise and sauce Tomate. French cuisine is well known for their sauces, that have very romantic sounding names. I’m even tempted to reserve the name Bourguignon for my second born :). I will be attempting a Bourguignon Sauce with dinner tonight. French cooking involves a lot of butter, which obviously is very far from healthy. I’ll be substituting butter with olive oil where possible or margarine where not. 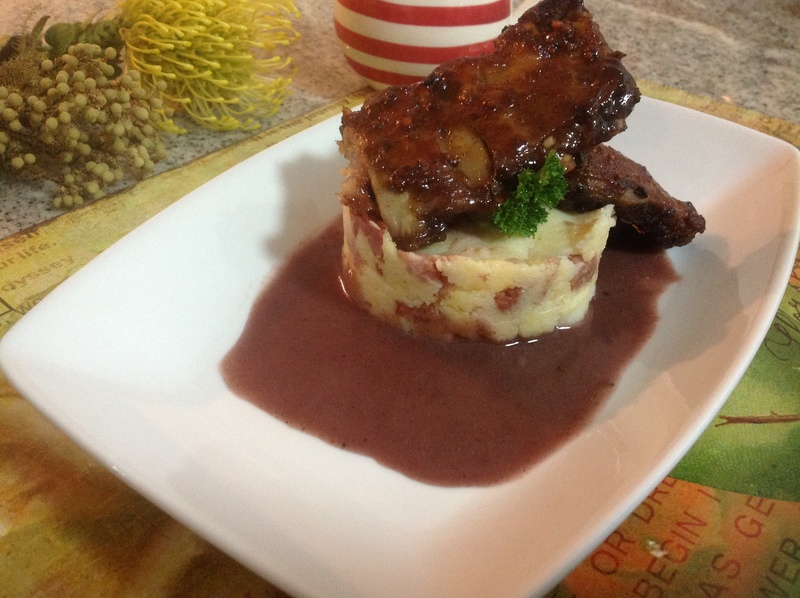 Bourguignon sauce goes well with red meats and is made from the mother ‘Espagnole sauce’. Yes, Espagnole means Spanish in French, the only word I recognized. There is no real consensus on how the Spanish got involved, some say it’s the Spanish ham and bacon, and some say it is the Spanish tomatoes. Either way I’m excited to try this. I’m not even sure I’ve ever had it. But it’s the Pork ribs I’m looking forward to eating the most; sticky, sweet and messy to eat but those juices are heavenly! I’m roasting it in the oven and basting it in the amazing Mzoli’s sauce. One word: yum :)! Mzoli is a man who runs a braai place in Cape Town, with the best basting sauce in town. I still have some left from my last visit. 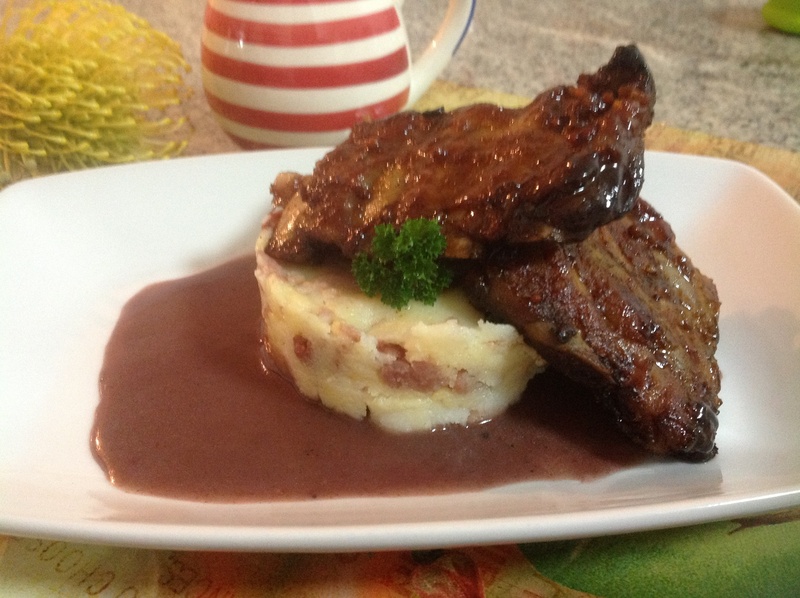 Pork ribs- I’m using loin not spare ribs( it doesn’t really matter which you use). The sticky ribs- Make a rub( 2 tbs of honey, juice of 1 orange, 1 tbs white wine vinegar, whole peppercorns, white pepper, salt and paprika), rub the ribs and place on roasting pan, with 1/2 cup of red wine then cover with foil. Pop into oven at 180 deg for 1 1/2 hrs( for ribs under 1 kg, increase oven time if more ribs). At 1hr 15 min, take out of oven, remove foil and baste some more using the rub or in my case, the Mzoli’s sauce at this stage. Then back into the oven, after increasing the heat to 230 deg and broiling the top of the ribs. Broiling is using the oven grill to get browning of the meat or for grilling. Out of the oven again in 15 min and baste with the rub again. They are so tender, so easy to just pull apart. The sauce- this is the most intricate part of this dish and it involves 2 parts. Part 1- the Espagnole sauce- In a pot, add in 60g of wheat flour and whisk with 60 ml of olive oil, over a hot stove. Let this brown a bit, while you keep on whisking. 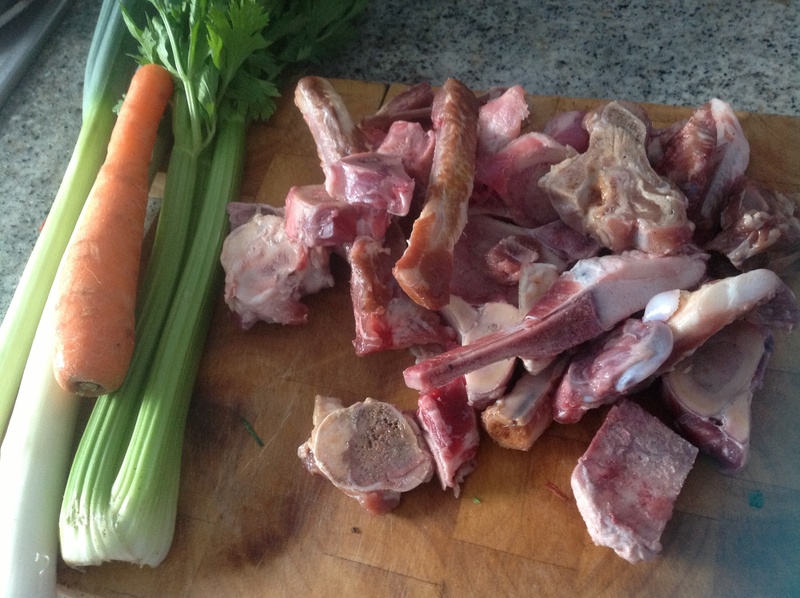 Then stir in 300 ml of chicken stock, 50 ml of water( this is now a roux), then add chopped leek, celery, carrot , an onion, garlic cloves and the beef bones. Let it reduce for 30-45 min, season with salt and pepper, 1 tsp of nutmeg and tomato paste or puree( which I forgot! But still tasted good). Reduce some more, then strain and cool. 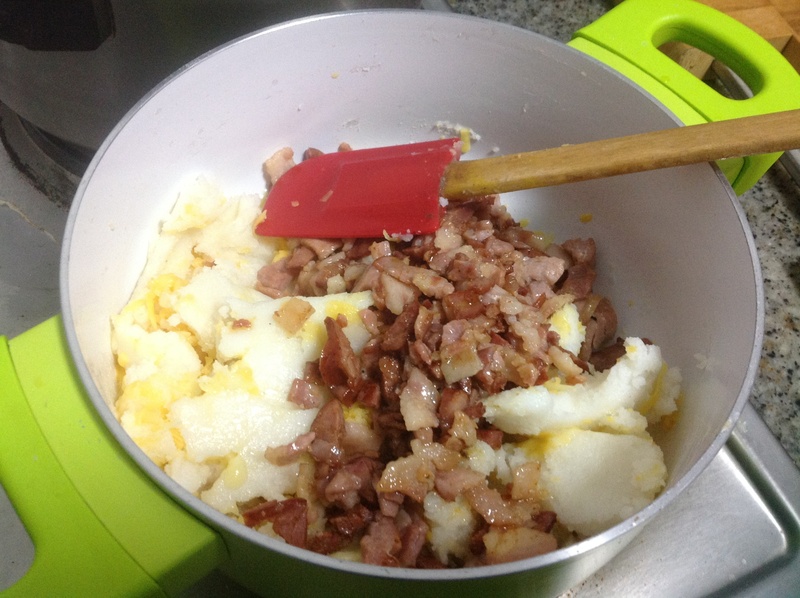 – Part 2- The Bourguignon sauce- in a hot pan with a drizzle of olive oil, soften a chopped onion. 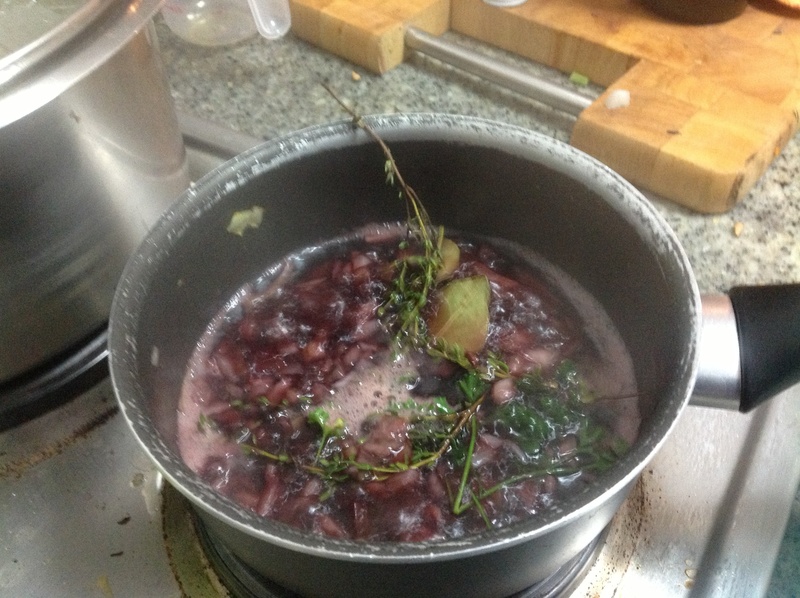 When soft, add 3/4 cup of red wine, handful of parsley, 3 twigs of thyme and 3 bay leaves. Let this reduce to half. Then season with salt, pepper. Strain the liquid. 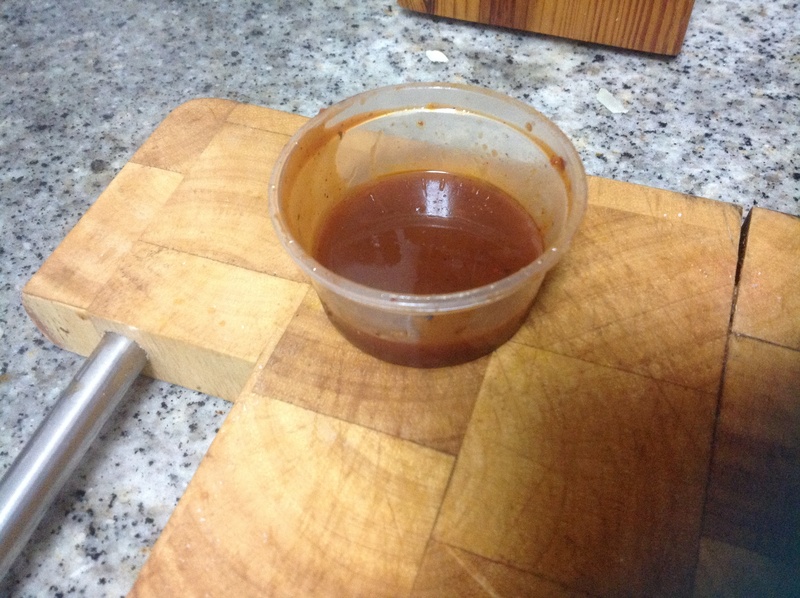 Put the strained sauce back into the pan on the hot stove, mix with the Espagnole sauce- equal parts. Season with 1/2 tsp of nutmeg, 1/2 tsp of cayenne pepper and salt & pepper to taste. 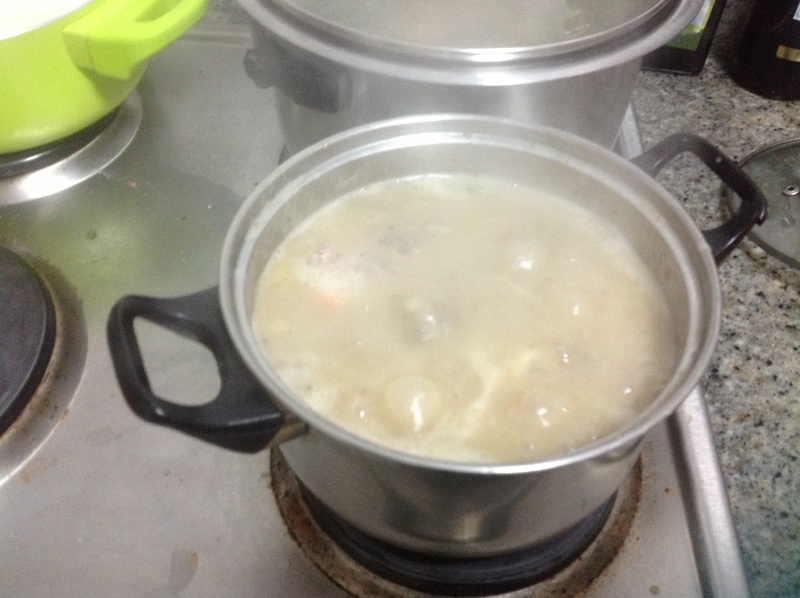 The Pap- In a hot pot, pour in 300 ml of boiling water and add 1/2 tsp of salt. 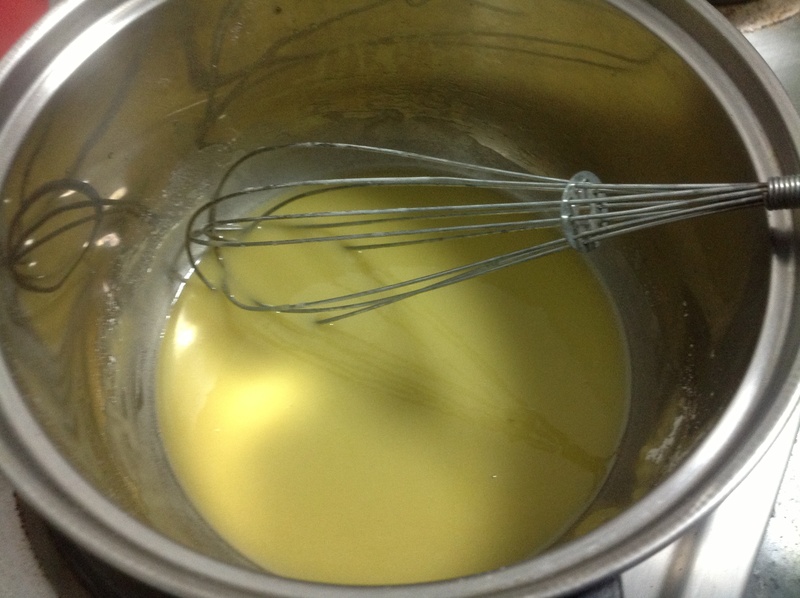 Pour in maize meal slowly while continuously whisking, until the desired consistency; thick and stiff. I’m using the quick to cook maize meal, this takes about 10 min. 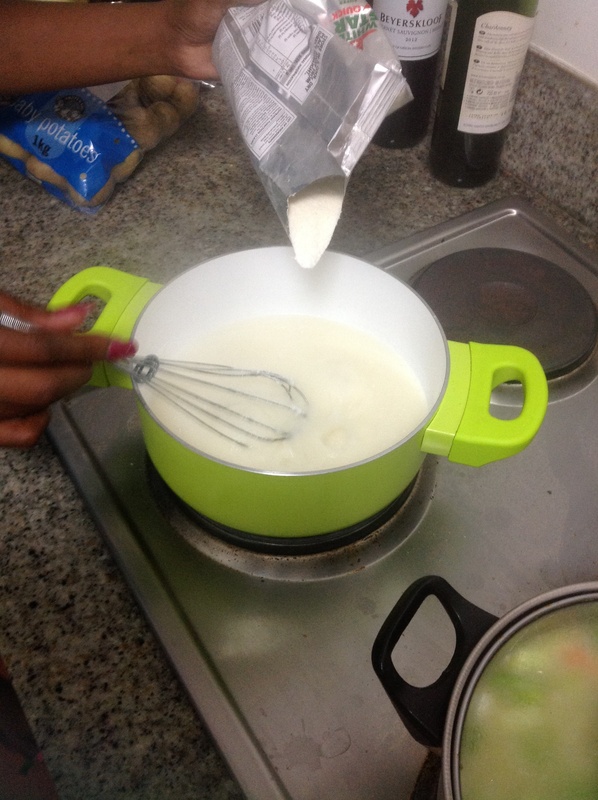 But normal maize meal will take 20-30 min, remember to frequently whisk or stir to prevent it from sticking to the bottom of the pot and getting burnt. Then in a hot pan drizzled with olive oil, add diced bacon and chorizo sausage. When bacon is slightly crispy, move off the stove. 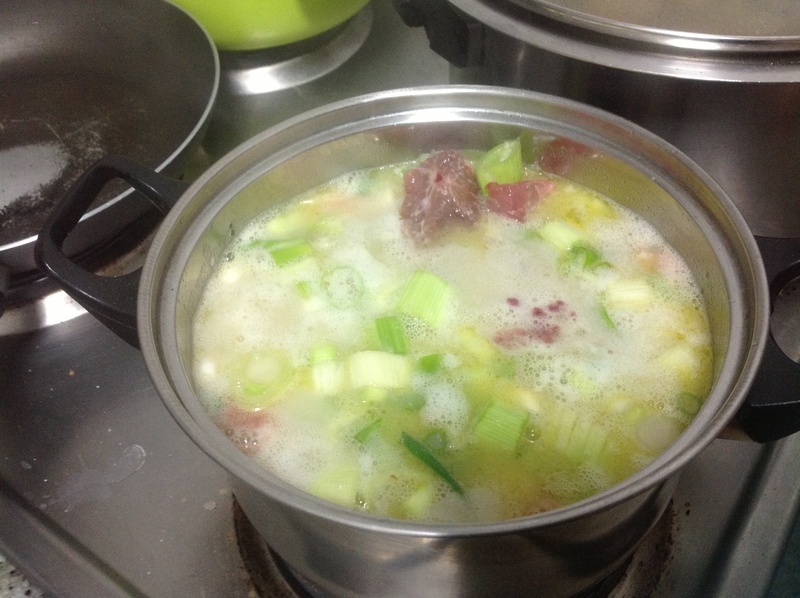 Mix into the Pap with 60g of cheese( 2 different types for more flavour).